The FLEX-5000 provides the greatest FLEXibility in being able to configure the RF input and output signal paths in more ways than any other amateur radio. This article will describe some of the different antenna configurations that are possible with the FLEX-5000. Before we begin our discussion, it is important to remember that the FLEX-5000 is a full duplex software defined radio. This means that the receiver and transmitter are independent of each other and do not share the same filtering components or RF signal paths. The same is true if the second receiver (RX2) is installed in the FLEX-5000. It too is fully independent of the transmitter and receiver circuitry as well, making the FLEX-5000 a true triplex software defined radio. The FLEX-5000 contains a RF switching matrix called the HFRIO board. The primary function of this component is to route RF signals to the appropriate device for the operation being performed, such as transmitting, receiving or both at the same time. The PowerSDR Antenna Selection form is used to configure the HRFIO switching matrix by assigning different antenna ports to the transmitter and receivers. There are several different configurations that are available for use with the FLEX-5000. By default, the FLEX-5000 uses the same transceiver port for both transmit and receive. You can also configure the FLEX-5000 to use a RX only receiving antenna that is separate from the transmit antenna. One unique feature of the FLEX-5000 series of transceivers is that it allows one to easily insert a receive (RX) only device into the RF signal path of the primary receiver (RX1). This capability is referred to as the "RX Loop". When the radio is transmitting, the resulting RF output is not routed through the "RX loop" whereby protecting sensitive receive only devices such as preamps from damaging RF energy. Therefore there is no need for manual switching to take the external receive preamp out of the RF signal path when transmitting. 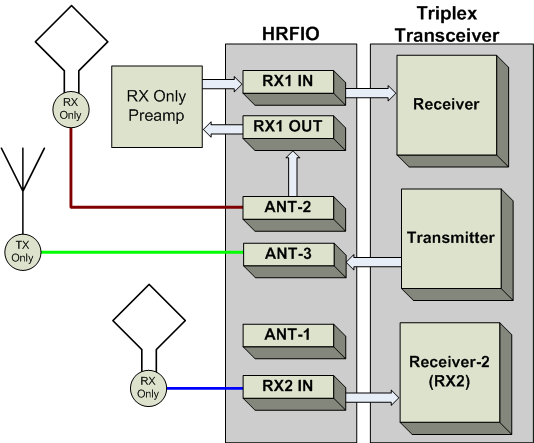 Since the FLEX-5000 becomes a triplex software defined radio once the RX2 (second receiver) is installed, you will have an additional configuration possibilities specifically for the RX2 that are independent of the RX1/TX and RX Loop configurations shown below. There is the standard RX2 receive only configuration which allows for diversity reception and when used with the HRFIO-34 (or above) board, you can also configure the RX2 in a SO2R mode where you can transmit on the same antenna connector where the RX2 is assigned. The examples below will show how to configure the PowerSDR Antenna Selection form for different modes of operation. In the Antenna Selection form, you can choose two Complexity levels; Simple or Expert. The difference between the two is as follows. Simple - The configuration you set is configured for ALL of the bands. Expert - The configuration you set is configured ONLY for the band displayed. This setting does not effect the examples below in any way except to determine which band the configuration is applied. Please be aware of this setting when setting your antenna configuration. In the standard transceiver operation mode RF signals are received and transmitted through the same transceiver antenna connector. There are three (3) of these Amphenol SO-239 ports on the FLEX-5000 and they are labeled ANT 1-3. Any one of these three can be selected for transceiver operation. 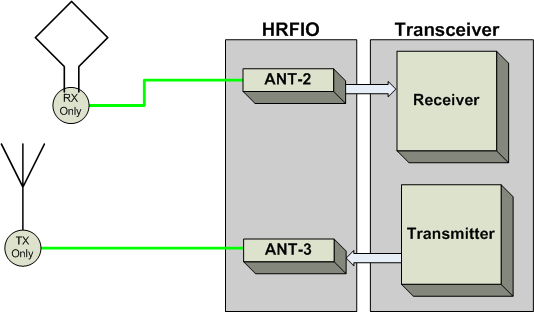 The HRFIO board performs the switching between the ANT 1-3 ports, the receiver and transmitter. The RF signal path is depicted below in Figure 1. To enable this configuration, open the Antenna Selection form in PowerSDR and assign ANT-1 as the Receiver 1 antenna input and the Transmit output using the antenna selection drop down box. Make sure to check the Lock box to ensure you are transmitting and receiving using the same antenna connector. 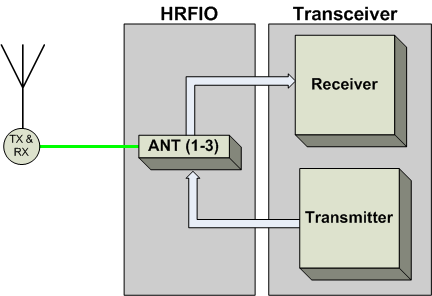 See Figure 1 for an example of how PowerSDR is configured to use the ANT-1 for both receive and transmit. On the back panel of the FLEX-5000 there are two Amphenol BNC connectors labeled RX1 IN and RX1 OUT. These are multi-function ports depending on how you have them configured in the Antenna Selection setup form in PowerSDR. In the default mode the RX1 IN port can be used to connect a receive only antenna to the FLEX-5000's primary receiver, such as a small receiving loop or a beverage antenna. In this configuration the RX1 OUT connector is not utilized. You are not restricted to using just the RX1 IN port for a receive only antenna. Since you can assign separate antennas independently to the receiver and the transmitter using any transceiver (ANT 1-3) connector that is not in use by the transmitter can be assigned to either receiver (if RX2 is installed). In this configuration, RF input is routed directly to the receiver via the RX1 IN or ANT1-3 port and the RF output is routed out to one of the three transceiver ports assigned to the transmitter. Refer to the RF signal path block diagram below in Figure 2 for an example of using RX1 IN for a receive only antenna. To enable this configuration, open the Antenna Selection form in PowerSDR and assign RX1 IN as the Receiver 1 antenna input and ANT-3 as the Transmit output using the antenna selection drop down box. Make sure to un-check the Lock box before making the changes because you are using separate transmit and receive antennas. See Figure 2 for an example of how PowerSDR is configured to use the RX1 IN for receive and the ANT-3 for transmit. 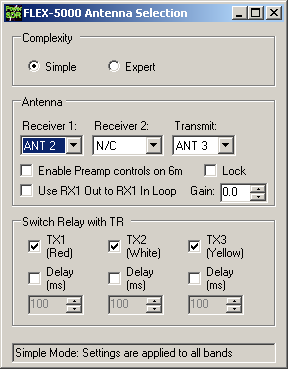 In the example below, the transceiver port ANT-2 is used exclusively for the receive only antenna and ANT-3 is being utilized for the transmit antenna. Figure 2a - Separate RX and TX mode using ANT-x connectors. The RX Loop mode of operation can be used with either the standard transceiver or separate RX/TX mode of operation. 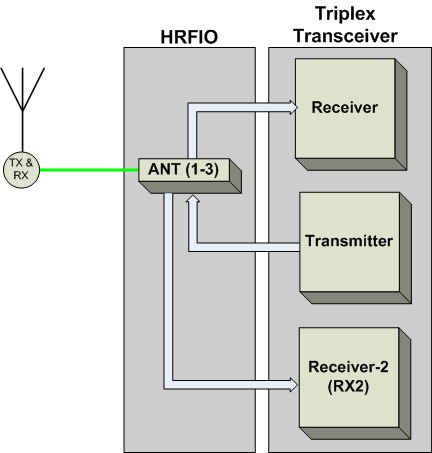 When the RX Loop is enabled, the received signals ingress the FLEX-5000 through the antenna port assigned to the primary (RX1) receiver, such as ANT 1-3, but there is an additional RF signal path that is automatically switched in by the HRFIO board which sends the RX signal out of the RX1 OUT BNC connector and it must be fed back into the RX1 IN BCN connector before being sent to the receiver. This allows you to connect the RX1 OUT connector to a preamp/filter INPUT and the preamp/filter OUTPUT to the RX1 IN connector for routing signals through the "loop" and then to the receiver. Refer to Figure 4 below for a representation of the RF signal path when using the RX Loop. One additional option you will find useful when using the RX loop capabilities of the FLEX-5000 is the ability to compensate for the additional gain provided by an external preamp. Adding additional gain to the RF input will skew the RX signal strength reading shown by the Panadapter and on the S meter. If you know how much gain is provided by the external RX preamp you are using, you can enter it into the Gain adjustment field (box) so that you continue to have accurate signal strength readings. To enable this configuration, open the Antenna Selection form in PowerSDR and assign ANT-3 as the Receiver 1 antenna input and the Transmit output using the antenna selection drop down box. Make sure to check the Lock box because the transmitter and receiver will be using the same antenna connector. To enable the RX Loop feature, check the box labeled Use RX1 Out to RX1 In Loop. 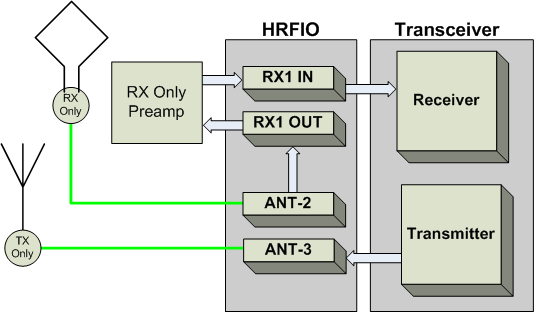 See Figure 3 for an example of how PowerSDR is configured to use the ANT-3 for transmit/receive and the RX LOOP for routing the RX signal through an external preamp. In the example below, ANT-2 is used as the receive only antenna input and ANT-3 is being utilized for the transmitter output with the RX Loop enabled. To enable this configuration, open the Antenna Selection form in PowerSDR and assign ANT-2 as the Receiver 1 antenna input and ANT-3 as the Transmit output using the antenna selection drop down box. Make sure to un-check the Lock box because transmitter and receiver will not be using the same antenna. To enable the RX Loop feature, check the box labeled Use RX1 Out to RX1 In Loop. 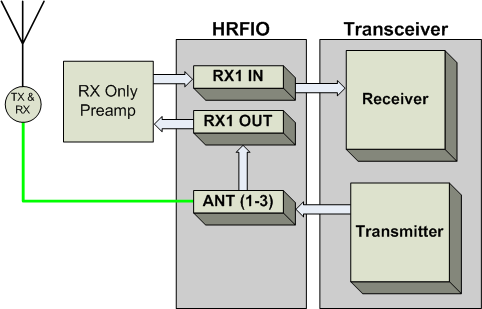 See figure 3a for an example of how PowerSDR is configured to use the ANT-3 for transmit/receive and the RX LOOP for routing the RX signal through an external preamp. NOTE: If you enable the Use RX1 Out to RX1 In Loop option in the Antenna Selection form and there is not an active device or a coax jumper that is routing the receive RF from the RX1 OUT to the RX1 IN ports, you will not receive any signals. NOTE: The RX1 OUT BNC connector is only active in the RX signal path when the RX Loop feature is enabled. The RX2 is an independent fully functional second receiver option for the FLEX-5000. There are several different ways you can assign an antenna port to the RX2. CAUTION: When transmitting with a separate receive only antenna connected to the RX2, the RX2 is not muted or switched out of the RF signal path. Although the RX2 has a very stout front end, you must take care that you do not overload the RX2 with excessive RF energy which can damage the receiver. Decoupling the receive only antenna when transmitting is highly recommended especially in high RF environments. This condition is applicable for any of the antenna configurations that the RX2 uses, such as when using the RX2 IN and the RX1 IN + RX1 TAP configurations. The RX2 Mute software configuration option is muting only the audio output from the RX2 and not actually turning the RX2 off during transmit. The RX2 is always on no matter what settings are used. If you do not have a separate receiving antenna for the RX2, the simplest way to utilize the RX2 is the "share" the same antenna that is assigned to RX1 by selecting the RX1 TAP antenna selection. On the HRFIO board, this is accomplished by using a splitter and a preamp or buffer amp to compensate for any induced losses. Using this configuration will allow you to listen to other frequencies on the same band that might exceed the sampling rate reception bandwidth window or to listen to other bands if your antenna is sufficiently multiple band capable. This configuration provides only limited diversity reception capabilities for AM and DSB signals. The RF signal path for this configuration is as depicted below in Figure 4. To enable this configuration, open the Antenna Selection form in PowerSDR and assign RX1 Tap as the Receiver 1 antenna input and ANT-2 as the Receiver 1 antenna input and the Transmit output using the antenna selection drop down box. Make sure to check the Lock box to ensure you are transmitting and receiving using the same antenna connector. 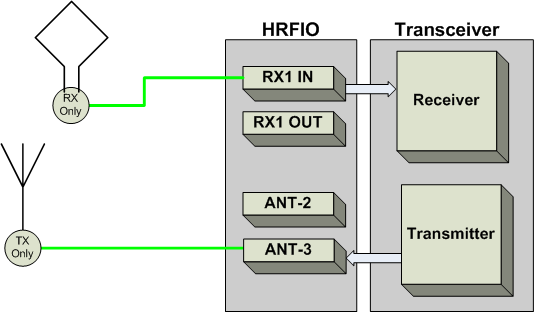 See Figure 4 for an example of how PowerSDR is configured to use the ANT-2 for both receive and transmit and the RX1 TAP for the RX2. If you do have a separate receiving antenna for the RX2, then it should be connected to the dedicated RX2 IN BNC connector and configured the same as using the RX1 TAP in the previous example except you assign RX2 IN as the Receiver 2 antenna connector. Using this configuration will allow you to listen to other frequencies on the same band or to listen to other bands the same as if you were using the single RX antenna configuration listed above, but you have the additional capability for enhanced diversity reception. Using this configuration will allow you to experiment with different diversity reception techniques depending on your antenna configuration to enhance reception by mitigating the effects of fading and to enhance the signal-to-noise ratio. NOTE: The RX2 antenna configurations are independent of the RX1/TX configurations listed above. You can have any of the configurations listed above as long is there is not a conflict with the association of an antenna port to an RF device (RX1/RX2 or TX). The following configuration example is going to be a little more complex since we are going to combine using separate antennas for the primary receiver (RX1) and the transmitter, add the RX Loop feature and have a separate receive only antenna for the RX2 to allow for diversity reception. The following The RF signal path for this configuration is depicted below in Figure 4a. In the example below, ANT-2 is used as a receive only antenna connector for RX1 and ANT-3 is being utilized for the transmit antenna connector with the RX Loop enabled. Additionally, the RX2 IN antenna connector is being assigned to the RX2 for diversity reception capabilities. To enable this configuration, open the Antenna Selection form in PowerSDR and assign RX2 IN as the Receiver 2 antenna input, ANT-2 as the Receiver 1 antenna input and ANT-3 as the Transmit output using the antenna selection drop down box. Make sure to un-check the Lock box because transmitter and receiver will not be using the same antenna. To enable the RX Loop feature, check the box labeled Use RX1 Out to RX1 In Loop. 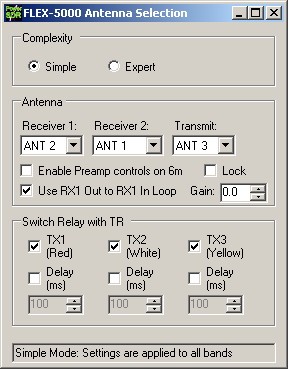 See figure 4a for an example of how PowerSDR is configured to use the ANT-3 for transmit, ANT-2 for receive and the RX LOOP for routing the RX signal through an external preamp with a separate RX2 antenna connected to the RX2 IN antenna input. 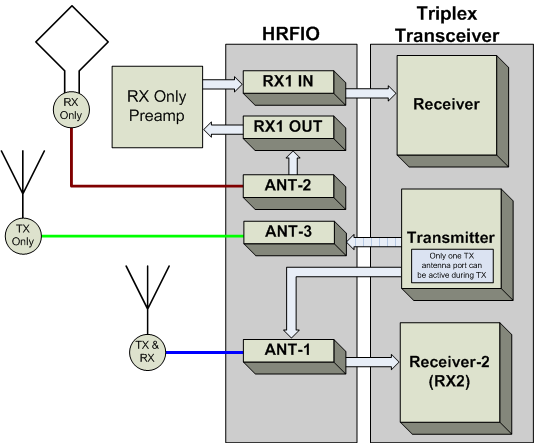 Figure 4a - RX2 Diversity Reception Configuration with Separate RX1 and TX Antennas with the RX Loop Feature Enabled. The FLEX-5000 allows you to operate as SO2R with a single radio. This is another first in ham radio for FlexRadio Systems. In order to facilitate a SO2R configuration, you must be able to transmit on either the primary RX1 frequency or the RX2 frequency. This means that the second receiver (RX2) must be able to be assigned to a transceiver antenna port as opposed to a receive only antenna input. This capability exist in the FLEX-5000 only if the HRFIO-34 (or greater) RF switching matrix board is installed in your radio. If your FLEX-5000 has the HRFIO-34 board installed, you can assign the RX2 to ANT-1, a transceiver port. With this configuration, you have the option of transmitting on the same frequency as the RX2 on ANT-1 or transmitting on the RX1 frequency with either ANT-2 or ANT-3. Building on the example directly above, we will modify the configuration so that the RX2 uses ANT-1 rather than the dedicated receive only RX1 IN antenna port. 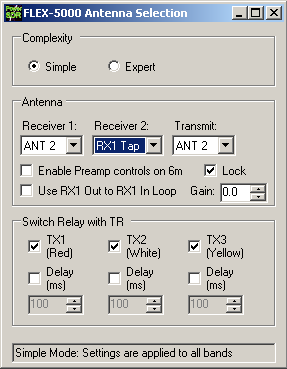 In this example, ANT-2 is used as a receive only antenna connector for RX1 and ANT-3 is being utilized for the transmit antenna connector with the RX Loop enabled. Additionally, the ANT-1 transceiver antenna connector is being assigned to the RX2 for SO2R and/or diversity reception capabilities. To enable this configuration, open the Antenna Selection form in PowerSDR and assign ANT-1 as the Receiver 2 antenna input, ANT-2 as the Receiver 1 antenna input and ANT-3 as the Transmit output using the antenna selection drop down box. Make sure to un-check the Lock box because transmitter and receiver will not be using the same antenna. To enable the RX Loop feature, check the box labeled Use RX1 Out to RX1 In Loop. 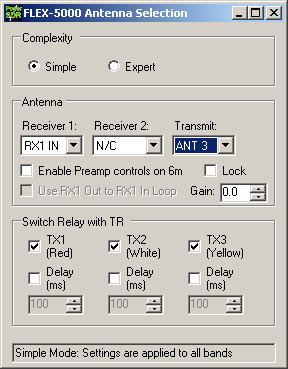 See Figure 5 for an example of how PowerSDR is configured to use the ANT-3 for transmit, ANT-2 for receive on the primary receiver and the RX LOOP for routing the RX signal through an external preamp with a separate RX2 antenna on the ANT-1 transceiver antenna connector. Figure 5 - RX2 SO2R/Diversity Reception Configuration with Separate RX1 and TX Antennas with the RX Loop Feature Enabled. Article has been viewed 25,984 times.